PT-658 making 33 knots in 2007. 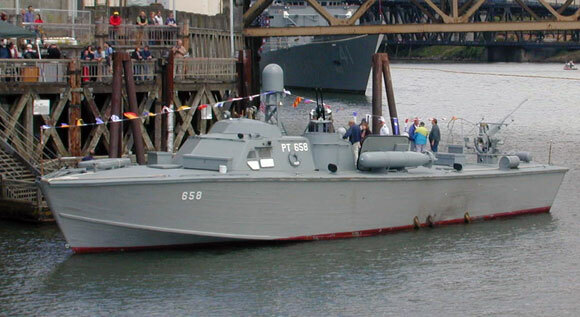 PT-658 was built at Higgins Industries Boatworks, New Orleans LA. Her keel was laid down 24 Feb 1945, she launched on 14 Feb 1945 and was completed on 30 Jul 1945. The boat was originally slated to be part of Squadron (RON) 45, which was never placed in commission. It was to consist of 11 Higgins PT's (649-660), and 11 Elco PT's (773-784) and assigned to the Pacific Fleet. Near the war's end in mid-1945, RON45 was scheduled to be "Lend-Leased" to the USSR. Several boats in the group (649-656) were already shipped to Russia when the transfer was halted, just before PTs 657-660 were to be sent over. The Elco construction contract was also canceled at this time. PTs 657-660 had been moved from New Orleans to Seattle on an LST, where they would be piggybacked onto a transport ship bound for Russia. When the war ended August, 1945 the shipment was stopped and the boats returned to Port Hueneme, CA. Then all four boats were reclassified as "Small Boat" C105342, 3, 4 and 5 (Crash Rescue Boats) in August 1946, and assigned to the Bureau of Aeronautics as "Remote Controlled Targets" at Naval Air Facility, Pt. Mugu, CA. (ex-PT-660 was actually sunk as a target by a "Bullpup" missile off Port Hueneme in the early 1990's.) PT-658 was reclassified again as "Floating Equipment" in Dec 3, 1948. Ten years later, on June 30, 1958, PT-658 was sold off as "war surplus" by the U.S. Navy to a private owner. PT-658 was acquired from the estate of one of these private owners (Mr. Orlando Brown of Oakland, CA) in 1993, who had intended on using her as a private pleasure craft. Very soon after the group acquired the boat, PT-658 broke loose from her moorings at Treasure Island Naval station and ran aground on a jetty, which pushed the starboard (right) rudder up through the hull and also created several holes in the transom. Soon after, the boat was refloated and transferred up to Portland Oregon by transport ship. Since 1994, PT-658 has been in the process of being restored by a dedicated group of PT Boat veterans and volunteers as part of "Save the PT Boat, Inc." at the Naval and Marine Corps Reserve Center Pier. PT Boats served in every theatre of WW II. 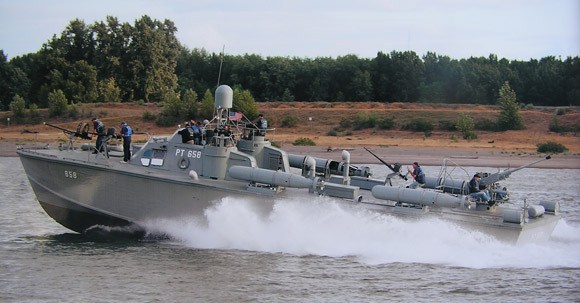 The Higgins 78' boats were periodically updated and reconfigured for the missions they were called upon to perform during World War 2. These boats also took on a "gun-boat" configuration, rather than their traditional torpedo role, because of the nature of wartime tactics in the Pacific. Many PT boats were given the task of harassing and destroying enemy troop supply barges in shallow waters at night since our larger destroyers would run aground in the shallow coastal waters. The PT boats became "Barge Busters" with their relentless attacks on the enemy barges used to supply and ferry the enemy from island to island. They were also called upon to support troop landings and downed pilot rescues. Higgins boats played a large role in the Mediterranean combating enemy shipping including duels with German E-boats, S-Boats (Schnellbooten) and heavily armored and armed barges known as F-lighters. PT-658 June 10, 2005 at the Portland Rose Festival.